It takes a special talent to explain science — and write a book on highly scientific topics — without erring in 2 possible ways. Typically science books for the layman go into far too much detail with far too much technical jargon and quickly leave the reader disheartened. They want to understand, but without a good intermediary to help bridge the gap from expert to everyman, they fail. Secondly, science can be explained in such a simplistic way that the reader is left wondering about its importance to the world and also, perhaps, about why scientists find it so difficult to make theoretical and experiential headway into the particular topic. Scientists are always trying to find the “sweet spot” between over complication and oversimplification and it is a difficult path to walk. Thankfully, Neil Degrasse Dyson has, for whatever reasons, been blessed with the ability to clearly explain complicated scientific concepts to the average person without either talking over their heads or, even worse, talking down to them. This collection of essays holds together nicely as a book, something that doesn’t always happen. Thinking back over my reading there were perhaps 2 times when I lost the thread of what was being discussed, but a quick re-read of a particularly troublesome section seemed to clear it up, at least enough for my purposes. When I read A Brief History of Time by Stephen Hawking† there were many times when I felt hopelessly lost in the world of theoretical physics, but Astrophysics for People in a Hurry kept me involved, enlightened and educated throughout. While many of us will never have a need for a deep knowledge of Astrophysics, I am a great believer in knowing a little about a lot. Learning new theories, reading new books and absorbing new ideas keeps us growing throughout our lives. 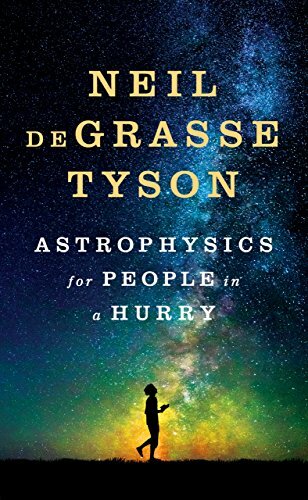 Pick up a copy of Astrophysics for People in a Hurry and I think you will enjoy the trip through the cosmos in all its, sometimes confusing, glory.